The Odd And Rigid Positioning Of The Arms Often Seen After A Concussion Is Called The? If you’ve played or watched a lot of contact sports over the years, or you’re simply a dedicated aficionado of “fail” videos, there’s a good chance that you’ve seen a fencing response without realizing it had a name. 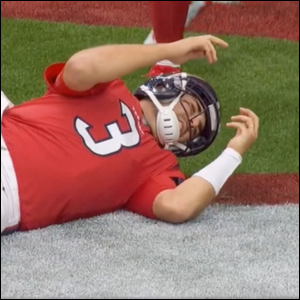 In many instances after a concussion, the concussed patient will position their arms, reflexively by automated response, in a strange looking and rigid position. This position, with one arm extended and one arm rigid beside the body (though sometimes manifesting as both hands clutched near the chest or both hands extended), is called the “fencing response” because of how similar the concussed patient looks to a fencer positioning their sword and free hand at the beginning of a match in the en garde position. While someone can suffer a serious head injury or concussion with no fencing response (in analysis of documented sports injuries, the fencing response was only seen around two-thirds of the time), the response itself is a direct result of a moderate to severe injury and if you should come across the fencing response during, say, one of your child’s sporting events, you should seek immediate medical attention for them (and encourage anyone else who experiences it to seek medical attention).